In late 2003, I was offered a job in France. After about a 5-second-long debate with my family, the yes decision was reached and we were ready to go. Living in France was an excellent experience especially after I understood that beer is not la bière but “un demi” and asking for coffee is useless (and it’s absolutely useless trying to say it with different accent) because what you really need to say is “grand crème”. The only thing which I never managed to do was to understand the bank teller who spoke excellent French but neither English nor Czech. And on my side, my French vocabulary never really got much beyond “un demi et grand crème s'il vous plaît“ and so making money transfers or paying bills directly was simply not possible. The time had arrived for me to learn how to use online banking. Before I first connected to BNP Paribas online, I took all possible precautions. I talked to the IT guys in our company. Following their recommendations, I installed avast! Home Edition (note - I had no idea it was a Czech product developed in Prague). AVAST was already very popular in France at that time. Just to make sure, I ran 2 deep scans of the whole computer, then installed AdAware and scanned the computer again for spyware. Only then did I feel confident enough to connect and pay the school lunches of our daughter. Since then, I have relaxed a bit and I actually can’t quite remember the last time I was in the bank. And, let me remind you that I’m back in Prague and the bank teller does speak my language. Looking at the statistics of Eurostat – these guys have data on everything – this development is clear. Fewer and fewer people have time to go to banks – or don’t understand the language the banker speaks. 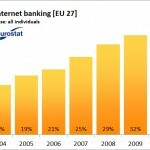 In 2010, almost 40% of all Europeans were using internet banking. There is no point to be paranoid about it and scan your computer twice. But please make sure you have your security up-to-date, because there are also some other statistics from Eurostat that we talked about last time (Eurostat on-line crime). BTW … Guess in what European country people avoid bank tellers the most?